If you were to pick up the next issue of HAL JORDAN AND THE GREEN LANTERN CORPS, no one could blame you for expecting it to star…well, Hal Jordan. He’s right there in the title, after all. However, as anyone who’s read last week’s issue #7 could tell you, Hal’s going through some changes right now that have him nowhere to be found as the series’ new storyline, “Bottled Light,” begins in issue #8. You know, rather than us telling you, we’ll let Venditti do the honors. He recently spoke with us about the state of the Green Lantern Corps, what fans can expect from its second Rebirth storyline, and why Guy Gardner probably isn’t your guy when it comes to getting out of a trap. One thing I love about Hal Jordan and the Green Lantern Corps is that I can really feel how broad the universe is now. You currently have the situation with Hal, the return of John Stewart and the Green Lantern Corps, and now in “Bottled Light,” we visit some new corners of space and deal with a few new characters. Is that something you’ve been working towards since starting on Green Lantern? With Rebirth, you want to be able to push the characters and stories in new directions, but you want to also embrace the legacies and history of these characters, along with the wider DCU. We’re the only book going right now that’s set out in space, so it’s up to us to embrace all of that cosmic tapestry that you have throughout the 75+ years the DC Universe has been in existence. I really wanted to try to do that with the series. That’s why you see things in issue #8 like Xudar and Starro. Plus, we have surprises even beyond those that you’ll get to by the end of the issue. It’s an effort to really try to embrace all these things. It’s such a fun sandbox, and to be on the book and get to play in it is really a great opportunity. I want to try and make the best of that, and as we go forward in this series, we’ll continue to do that. I think it’s easy for fans, myself included, to sort of think of Hal Jordan and the Green Lantern Corps as just the new version of The New 52’s GREEN LANTERN, but it’s not just about Hal. That second part of the title is just as dominant as the first part. And now, after the way issue #7 ended, I don’t know when we’ll even be seeing Hal again. Yeah, we learned that Hal created his own ring from his own will, and what we found out throughout the first arc is that there’s a transformative process happening with him where he’s almost becoming will. At the end of issue #7, he allows that process to happen—he becomes willpower and detonates Warworld and now he’s lost. That’s where we open the “Bottled Light” arc. Will “Bottled Light” be focusing more on John Stewart and the Corps? The Green Lantern Corps features four very well known and popular Green Lanterns—Hal Jordan, John Stewart, Guy Gardner and Kyle Rayner. The fans want to see all of them, and they’re all great characters, but I was concerned from the beginning that if I tried to make each issue about all of them, then the issues wouldn’t be about any of them. So what I wanted to do with the first arc is tell a primarily Hal Jordan story, but Guy Gardner played a very key role as well, and I’ve put them in situations that fit them as a characters. We’re moving onto the second arc now, and it’s going to be very focused on John Stewart, where he and the Corps find themselves trapped in what I would say is the universe’s greatest trap and John has to think his way out of it. We’re also going to have elements of Kyle Rayner in this second arc as well. I’m really trying to put all of the characters in situations that allow them to shine and show what makes them unique, but also to very effective as individual Green Lanterns. I think we’re really able to build some character moments for this group in a much better way than if it were the four of them tackling everything together. By keeping them somewhat separate, they can all stand out? They’re all Green Lanterns and they’re all very successful and have these great storied careers. But what makes them effective Lanterns, also separates them all in a sense. They’re all very unique in their approach to it. If you were to put Hal inside a trap like we have in “Bottled Light,” I’m not sure he’d be able to figure out how to get out of it. Guy would sit there and punch the wall the entire time. Conversely, John wouldn’t just go and attack Warworld all by himself. It’s just not the way he’s built. It takes an immense amount of willpower and the ability to overcome fear to attack Warworld all by yourself, but it also takes an immense amount of willpower to realize you’re in a horrendous trap, and take your time, think about it and know that when you move to get out of it, you’re going to be successful. There’s willpower in restraint and there’s willpower in no restraint. So what else can you tell us about the story of “Bottled Light”? Well, like I said, it’s focused more on John Stewart, but Hal Jordan plays a big role as well. It’s more of a thinking man’s conflict. It’s more cerebral what John finds himself going up against. You’re going to find out why he has the skill set that allows him to excel against that type of conflict, and also what makes him different as a leader of the Green Lantern Corps. John is someone who’s really able to see all the pieces on the board. He has a Corps made up of aliens from all different cultures from all throughout the universe, each with their own unique power set. Those are all individual pieces that he’s able to see and implement in ways that others might not in order to really maximize the Corps’ effectiveness. Beyond that, something I wanted to do with the second arc was really embrace legacy. We’re going to tie some very classic DCU cosmic concepts in with the great Green Lantern mythology that Geoff Johns built up in ways that I think are going to surprise you. Also, there’s Hal and what is happening with him, and what the next step is in his journey after he became will. We’re really going to tap into a lot of Green Lantern history there as well. Ethan Van Sciver drew issue #8, and when he and I first got to talking, he said he really wanted to do some classic concept stuff, and this is a story that I’ve been thinking about telling for years. He has such an affinity and a love for these characters, and he knows the DCU so well. It’s some of the most fun that I’ve ever had writing a story. Is Ethan going to be drawing more of this arc? Yes, he’s drawing issue #12 as well. He’s drawing the first issue and the last issue of this arc. One other element that’s happening in the story is that now you have these members of the Sinestro Corps that went rogue and helped the Green Lanterns. Having them now trapped with John Stewart and the Green Lantern Corps after issue #8—what dynamic does that bring? We had the cliffhanger at the end of issue #7 where Sinestro’s daughter Soranik was instrumental in saving Guy and the rest of the captives from Warworld before it exploded. 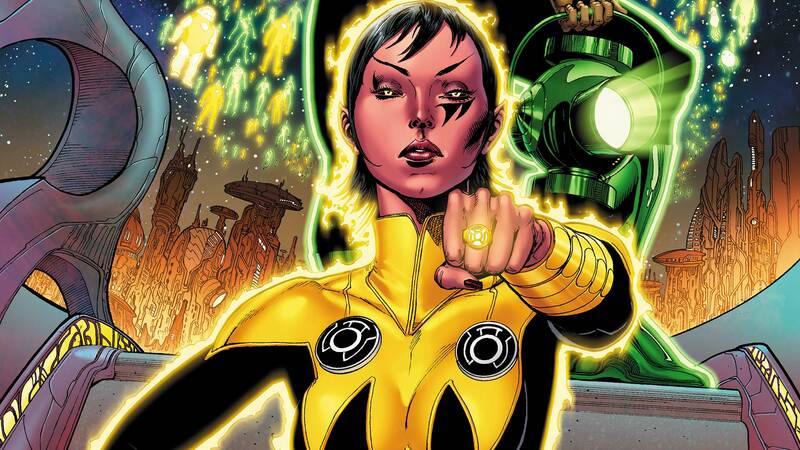 Now she wants to do what her father never was able to do, and that’s make the Sinestro Corps a force for good throughout the universe. She used to be a Green Lantern, but she has no interest in going back to that right now. Rather, she wants to try to take what her father made and make good out of it, as daunting of a task as that may be. But as she says in issue #7, it’s not so much Sinestro being a bad father that she finds hard to cope with, it’s him being a bad man. She wants to take what he did and make some good out of it, so that her father could have done something positive for once in his life. You have the two Green Lantern books now and so far they’ve been pretty separate from each other. Are there any plans to have the two books link up at some point? Sam [Humphries] is doing great work on GREEN LANTERNS. The books are separate for right now, but I think a part of what fans appreciate about the Green Lantern franchise is the ability for all of the Lanterns to end up in the same place at certain times for larger events. We absolutely have talked about those things. I can’t go into detail much beyond that, but the answer is yes. HAL JORDAN AND THE GREEN LANTERN CORPS #8 by Robert Venditti and Ethan Van Sciver is in stores on Wednesday, November 9th.